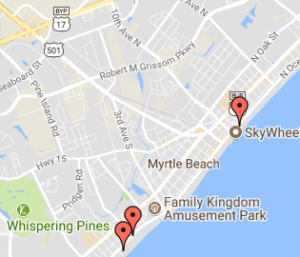 Broadway at the Beach is one of the most popular destinations in Myrtle Beach, providing visitors and locals an array of stores, restaurants, nightlife and a handful of attractions. Plenty of local and specialty shops dot the elaborate attraction center, including jewelry stores, specialty boutiques, food shops and niche shops like Build-A-Bear Workshop, Broadway T-Shirt Co., and Christmas at the Beach. If you’re looking to grab a bite, Broadway features plenty of appetizing options, including Dave & Buster’s, Carolina Ale House, Jimmy Buffet’s Margaritaville, King Kong Sushi and Paula Deen’s Family Kitchen. Broadway also offers plenty of family-friendly and exciting attractions like the Big D Theater, Broadway Grand Prix, Pavilion Park, Ripley’s Aquarium and miniature golf. Broadway at the Beach also holds events and festivals throughout the year, so there’s always something to do and see at this must-visit destination. For more information please call, (843)-444-3200.